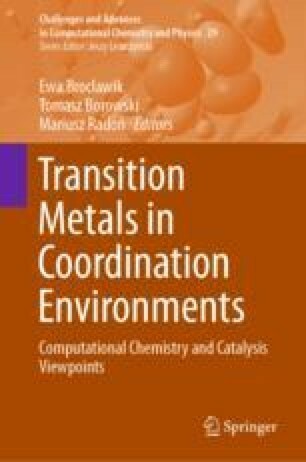 Knowledge of the electronic structure of transition-metal complexes is increasingly being obtained through joint efforts by theory and experiments. Here, we describe a variety of examples where spectroscopy is being used to determine, e.g., the oxidation state, spin state, or coordination environment around redox-active metal ions such as iron, manganese, or nickel. Both enzymatic and biomimetic systems are included, from the literature and from our own laboratories. It is shown that the combined efforts of wet and dry laboratories lead to a more profound understanding, and allows for systematic exploration of coordinate chemistry around the central metal atom. The COST association action CM1305 ECOSTBio (STSM grant 34080), the European Research Council (ERC 279549, WRB), the labex arcane (ANR-11-LABX-003), MINECO (CTQ2014-59212-P, CTQ2015-70851-ERC, CTQ2017-87392-P, MS), GenCat (2014SGR1202, MS), FEDER (UNGI10-4E-801, MS), and the Serbian Ministry of Science (Grant No. 172035) are acknowledged for financial support.